My own horn. Cuz not all of my homemade Christmas Gifts ended in disaster this year. Tears, yes. Large quantities of blood, of course. Sweat? No! I'm a lady, chumps! I ain't got no sweat glands! 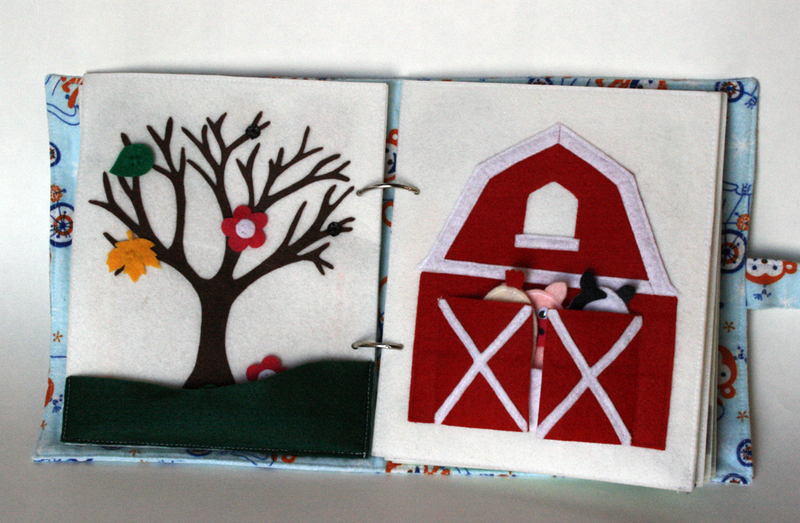 My big homemade project was quiet books for each of the boys. My mistake was, I didn't think it WAS a big project. I got everything else done by Thanksgiving, and figured I would just work on the quiet books in the evenings after the boys were in bed for a few nights and turn those puppies out in no time. Didn't work out quite that way though. I finished at 12:30 am on December 22nd. And I was working almost every possible second until then. I was up until 2:00 am for a couple of weeks straight. Just a fun little tid bit of info I though you might enjoy. So, I made Colin's quiet book based on a pattern found on Serving Pink Lemonade. It is cute and most importantly, free! Though I would have paid money for it. Look how cute? She really should be charging for that. I'm not gonna show you the whole book, though, cuz my book looks just like hers for the most part. If you care, click that link up there. Or click this one. Or even this one. It doesn't matter to me. 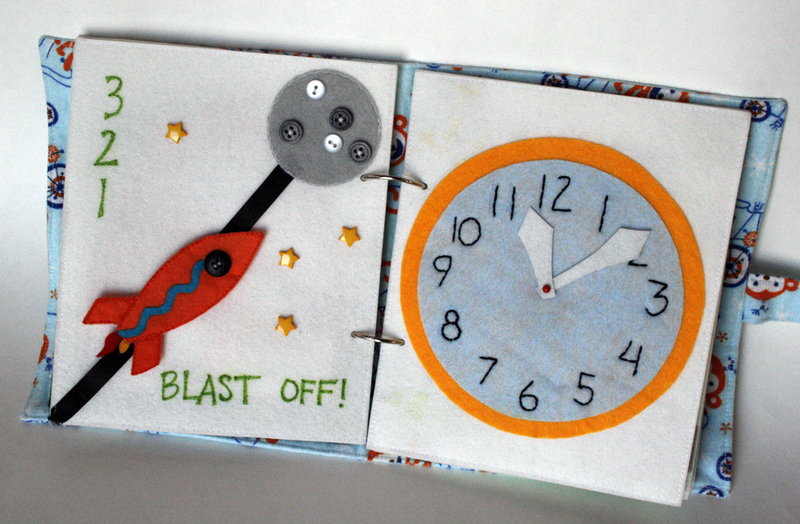 I copied that rocket page from Handmade By Jill. So far, Colin just tries with all his might to rip that rocket ship out of there. Those poor astronauts are never gonna make it to the moon as long as Colin is the guy at mission control. And then I added this camping page, which I also copied from Handmade by Jill. But it was my idea to add the moon and tree in there. Yep. MY IDEA. I got a few. 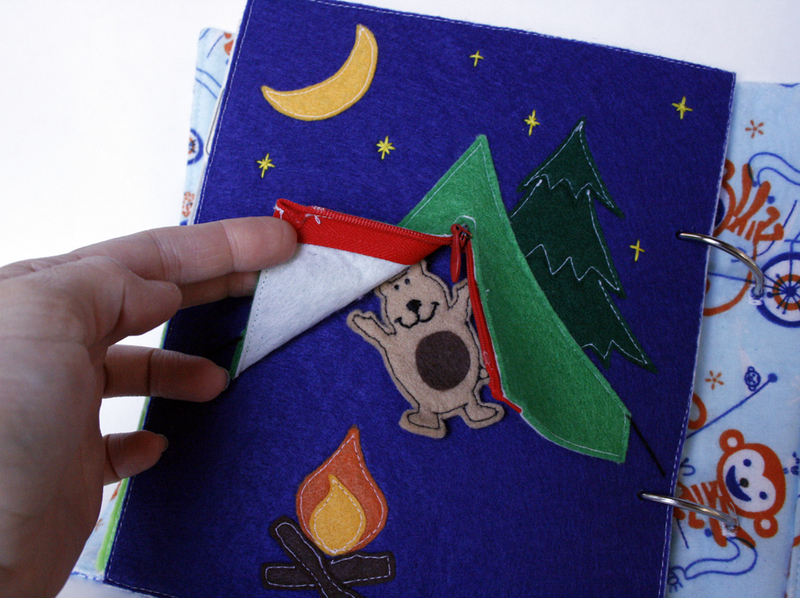 I especially love the little ropies holding the tent down. I think Richard told me they are Guy Ropes? I don't know. I thought that sounded pretty sexist. So, you just get back after a rigourous hike to the top of the summit of the peak of the mountain, and can't wait to curl up in your top-of-the-line sleeping bag, and Surprise! There is a Bear in your tent! Colin loves him. He spends a lot of time hugging that crooked-bellied little bear. Actually, he doesn't really care about much else in the book. 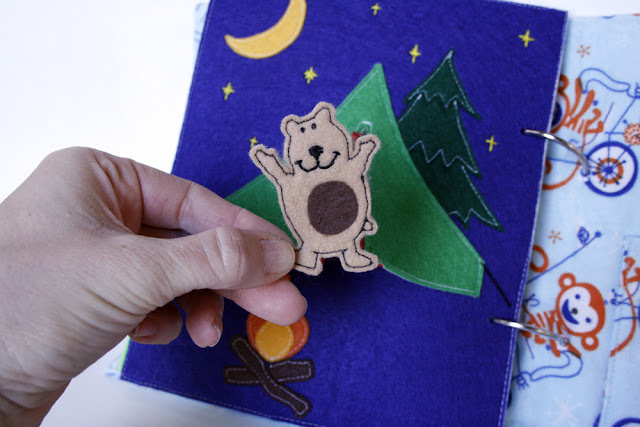 But he loves to play with that zipper and hug the bear. And now I have to wonder why I wanted him to learn how to use a zipper in the first place? Now he unzips my purse and pulls out all the change, cards and other, more embarrassing items which are none of your business. He unzips his jammies and his coat and he opens rogue bags of curlers I didn't realize I had anymore and spreads them all over the house. It's wonderful. 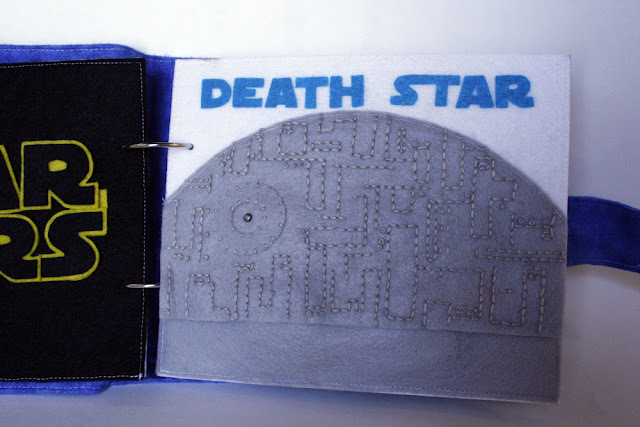 I made Harrison the "JEDI QUIET BOOK" which you have probably seen on Pinterest. You can see it here. It is very, very awesome. She is crazy awesome. AND she also has a Star Trek Quiet Book, which you have got to see. I bought the pattern for the book from her etsy shop, but - and I only tell you this in case you plan to make a book identical to mine - I made a few changes. 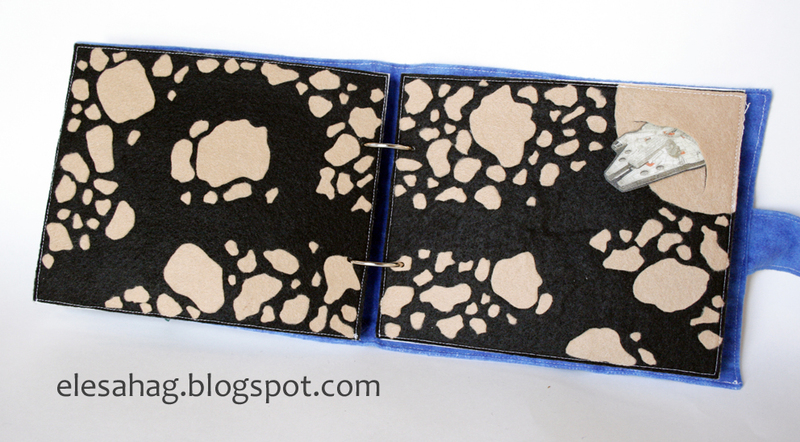 I used stiff, non fusible pellon for the white pages, and attached my felt to the pellon with Wonder Under for the black pages. 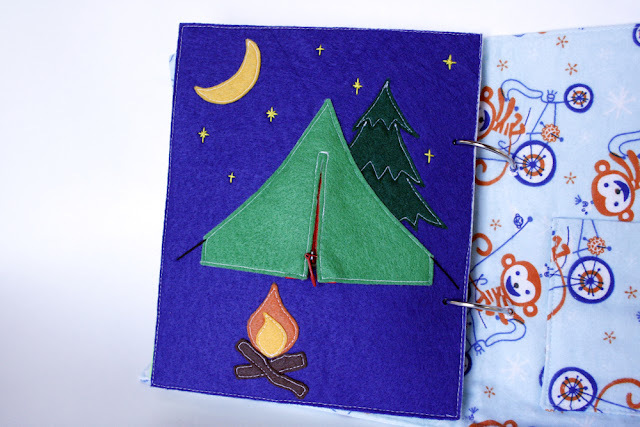 Then I sewed two pages back to back to make them two sided instead of just one. TRICKSY! And now I know that at this point in his life, Harrison is not really interested in snaps. 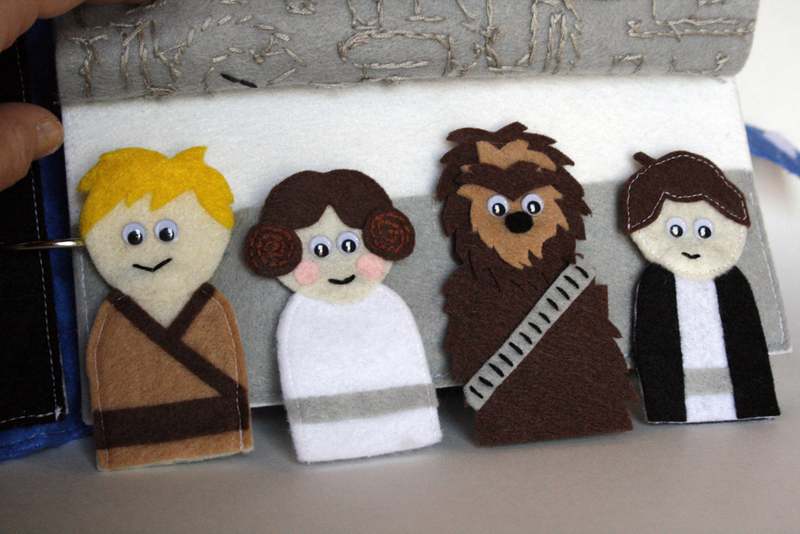 The girl who made this book didn't include a Chewbacca finger puppet, so I bought some finger puppets from The Idea Room. All the finger puppets above came from there. That guy on the left there is Luke. Richard thought it was Anakin, since Luke never wore an oufit that looked like that. Now I know. And now I know you can't trust every pattern you buy on the internet. I wanted Harrison's book to have as many pages as Colin's, but that left me quite a few pages short. So Richard and I had some brain storming sessions to come up with some other pages we could throw in. Making my own pages was by far the funnest part. Here is what we came up with. 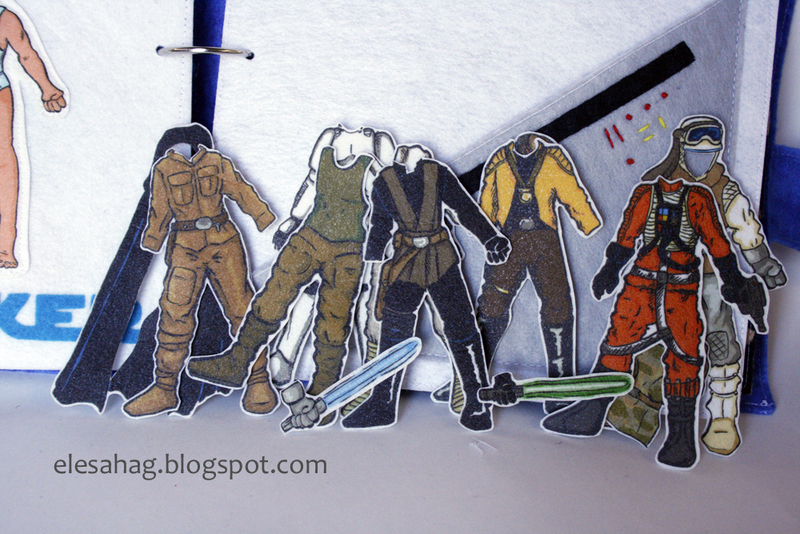 I found a Luke Skywalker paperdoll here, which included every single outfit Luke ever wore. It is awesomeness itself. I printed them on t-shirt transfer paper and ironed it onto the pellon. Worked beautifully. 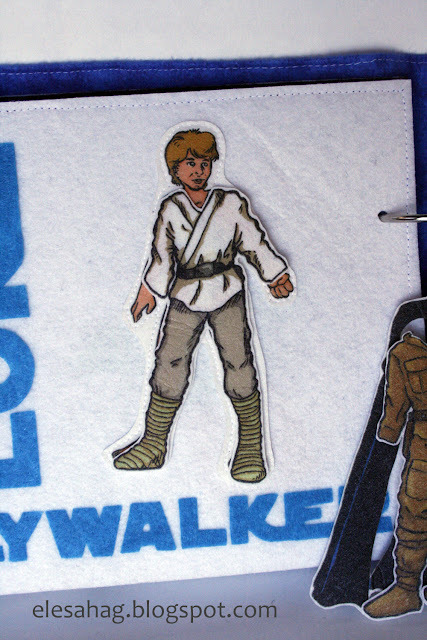 Then I sewed Luke onto the page, and made a Jedi-y sort of pocket for all his clothes to go in. This is Harrison's favorite page. He likes to try the clothes on all of the finger puppets. Then you get to help the Millenium Falcon navigate the asteroid feild! OOh! So difficult! I feel like those asteroids need some more detail, but since I was making this at about 1:00 am on December 21st, I really didn't care anymore. 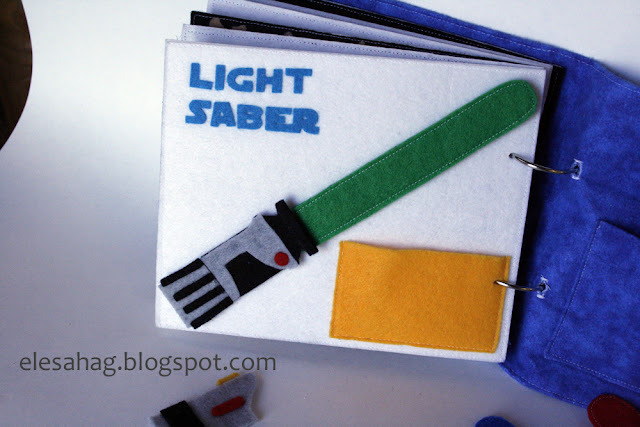 the Build Your Own Lightsaber page! 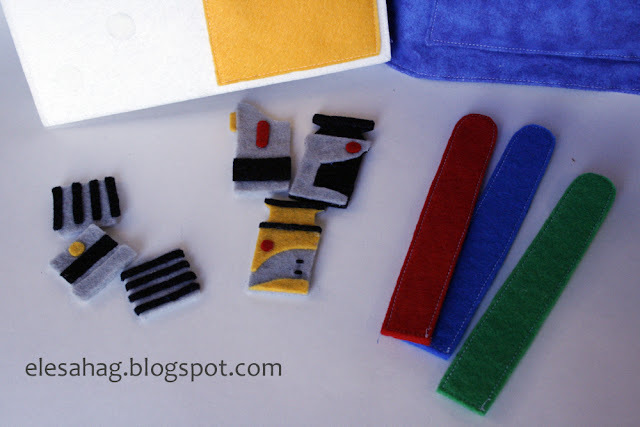 He's got all these spiffy parts, and with the magic of velcro, gets to put them together into a light saber of his own. He would really like it if the light sabers came off the page so he could swing them around and fight with them, but the magic of velcro can only do so much. 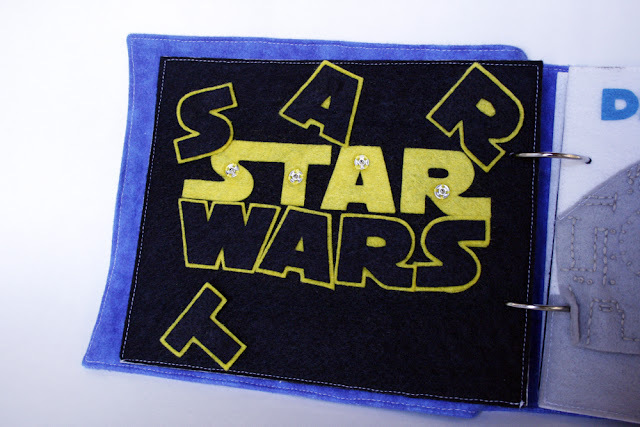 I made that little yellow pocket to hold all the light saber pieces, but it isn't nearly big enough. I had to add another pocket inside the back cover to hold it all. And so, in conclusion, Harrison's book is way too big! There is just too much stuff in there. And too many removable parts. This is meant as a quiet book for church, and it sort of works, but not until the pew is strewn with every single item that can be removed out of the entire book. I don't necessarily recommend putting so much time and effort into a gift your children will try to destroy. And while Harrison really likes the book, I think, the only pages he spends any time on are the Luke page and the light saber page. And he likes the finger puppets. A lot. Really, I should just turn the pages he likes into seperate little Folder Games that he can take out ONE AT A TIME and then put away. If only he would listen to me. Which he doesn't. Especially not when I am whispering. Like I usually do at church. Usually. Someone is yelling, but 63% of the time, it isn't me. This Post May Not Be Entirely True.